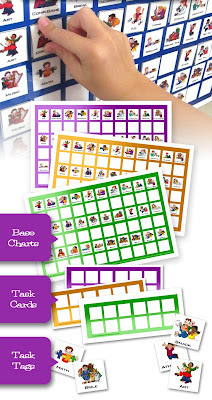 Over the last few months, a couple thousand moms have downloaded my Task Card system. It sounds as if many have found them to be exactly what they've needed to not only organize their homeschool day but also encourage some independent learning. 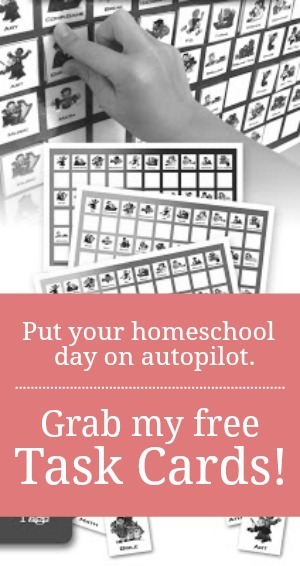 That being said, however, I do receive a few emails/messages each week with questions regarding how to set it all up and how to implement it into the homeschool day. What works for my homeschool, may or may not work for yours. Feel free to listen to my spiel, but then adapt or evolve the system for your own children. My best gal pals can attest that I am a fast talker and that I NEVER stop talking. Brevity has never come easy for me. My apologies in advance. As I mentioned, the base charts get rather heavy when filled with all the tags. I used Command Small Picture Hanging Strips to attach the base chart to the wall without damaging my paint. I'd also really recommend using high quality velcro dots to secure the tags to the base charts, otherwise you might find yourself replacing dots over time. Although we start and end our day at the same time, we tackle the rest of the school day without a set time schedule. Instead, we have a daily flow...a rotation of subjects in groups of three. 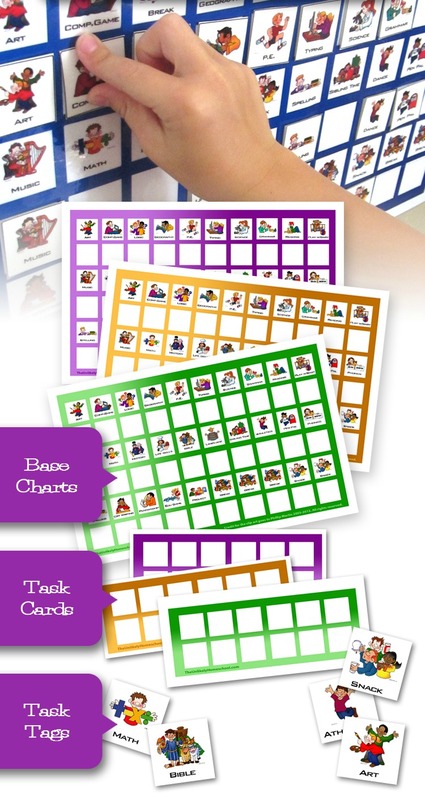 Here's a few last minute tips for ordering task cards. Obviously subjects done altogether need to be planned for when you ALL will be available to do them. For me, it is easiest to schedule these at the natural "start ups" of the day...the start of the morning just after I do a few preschool activities with my littlest learner and just after lunch/afternoon chores. One of the primary reasons for implementing work boxes or task cards is to encourage independence. Once the task cards are in place, you should not have to tell your child what they should be working on and you should not find them wandering around with nothing to do. They should be responsible to consult their card and get busy on the next task. In order for a child to be TRULY independent with his/her work, the work has to be easily accessible. All books and supplies should be stored in such a way that a child can get the, and put them back ALL BY THEMSELVES. The older the child, the more helpful task cards become. Obviously with my kindergartener, the task cards have been a nice learning process. I don't expect as much independence from him as I do from my fourth grade. She, on the other hand, can and DOES work through her card with very little involvement from me. There are, obviously, still subjects that I work on with her. But, the responsibility to be ready for those subjects...and ready ON TIME...lies on her. These cards have revolutionized our day. They have given us order, allowed us to include some fun extras throughout each day, and have encouraged some much-needed independence. I hope they will be a help to you, as well. For more information or to find out how to access the Task Cards, be sure to read my original post. What a great idea! I just printed them off and will laminate them soon. :) I tried getting both of my older kids a planner this year so I could write down what they needed to do each day, but that never panned out like I hoped. I think they'll like this. Thanks again, Jamie! You'll have to let me know how they work for you. Yea!! So glad they started off with a bang. And thanks for letting me know. My middle boy loooooves comp game too. Thank you so much for this printable! I printed them off this morning on 8.5x11 and they worked great for us and the space we have--my daughter loved it!! I know they say there are no silly questions, but...how do your children know what to do when they get a particular task off the card? For instance, if they have math to start, how do they know what math to do? When do you accomplish the additional preparations that requires beyond setting up the task cards? Thank you, by the way. We've been trying to find a way to make the workbox system work for us, too. Is there a way to access the printable without a Facebook account? I don't have one and have no desire to get one. Thanks for making these available and for the video tutorials. I'm new to homeschooling (this will be our 1st year) and I think these will be helpful for ME (& the kiddos too) to remind me what is supposed to be going on. Thanks! So glad to know! Have a great school year! Thank you! These cards just look great! From how old would you think they might be helpful? I think you could actually use them with a child as young as 4. They don't have to be able to read because the pictures show each task.